If you needed any more reasons to make sure you vote this year, this ought to do it. And if you've ever wondered why the Massachusetts state budget is so bloated with feel-good socialist-like spending, and why our state continues to raise taxes and become more business un-friendly, this ought to help answer the question. As WorldNetDaily reported last week, the a U.S.-based Marxist-oriented socialist organization has released a list of Massachusetts politicians it supports in upcoming congressional and state Senate elections. The list was released by the Yankee Radical, the Boston newsletter of the Institute for Democratic Socialism, the educational arm of Democratic Socialists of America, or DSA. 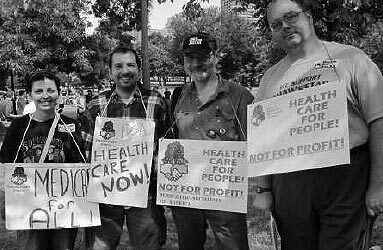 Massachusetts DSA members out demonstrationg for Obama's health care plan. The list of well-known legislators they're endorsing is pretty scary. Several of them are very influential on Beacon Hill. They're pushing the cause. According to the report, Sonia Chang-Diaz -- their point person on several key legislative committees -- "worked to protect K-12 funding, helped shape the educational reform package aimed at ending the achievement-gap, and fought to protect millions of dollars going to youth intervention programs, housing assistance and community healthcare." Several of these incumbents are currently facing tough challenges. In one of our favorite races, Socialist-backed Susan Fargo is locked in heated race with Sandi Martinez. Let's do everything we can to make sure that this is the year the Massachusetts voters clean house (and senate)!